Fiona, our elderly, Master Hunter titled ESS, unique in her stoutly build, ached badly in her hind quarters and lower back, a condition related to her lengthy body and unusually short legs… kind of a Bassett Hound look, that combined with old age. To her rescue came Lee Chockley, canine and Equine massage therapist. Lee is masterful not only as a dog whisper, but as a canine masseuse. Lee went right to work on shy Fiona, who relaxed and healed under his care and massage. 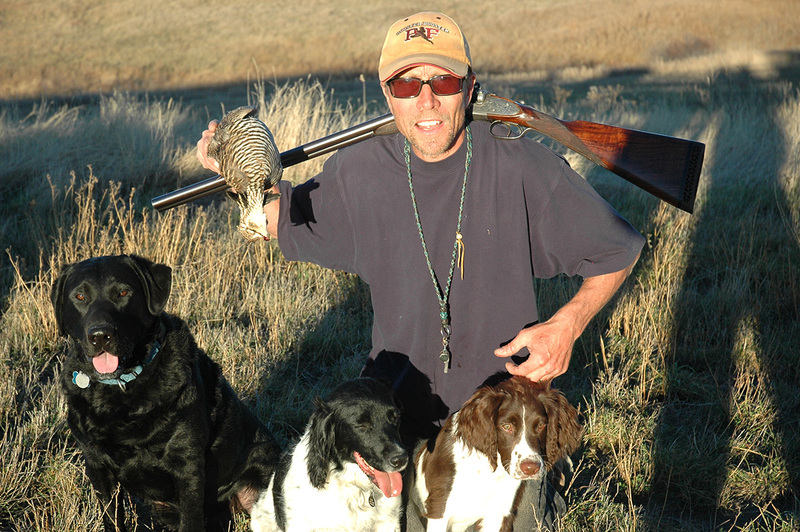 If you have an aging or ailing gun dog, consider contacting a professional like Lee Chockley. Fiona came to our family as a gift, a blessing of love from a fellow spaniel friend, Mhari Peschel. Mhari is one of the best breeders in North America according to Lynn Miller, famous spaniel trainer and national trial judge. 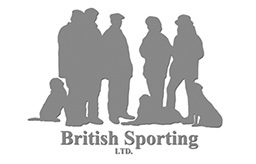 To be on the English springer spaniel trial circuit would result in befriending Mhari Peschel. Her kindness is legendary. Through folks I know back in Wisconsin where I grew up, Mhari offered, out of the blue, to bring my Mac, then 8 weeks old, out to Boulder, Colorado for me. Mhari picked up my pup at a Nebraska field trial from another legendary breeder and trainer, Dan Langhans, RIP. Mhari offered Fiona to our family when we lost our beloved Izzy. 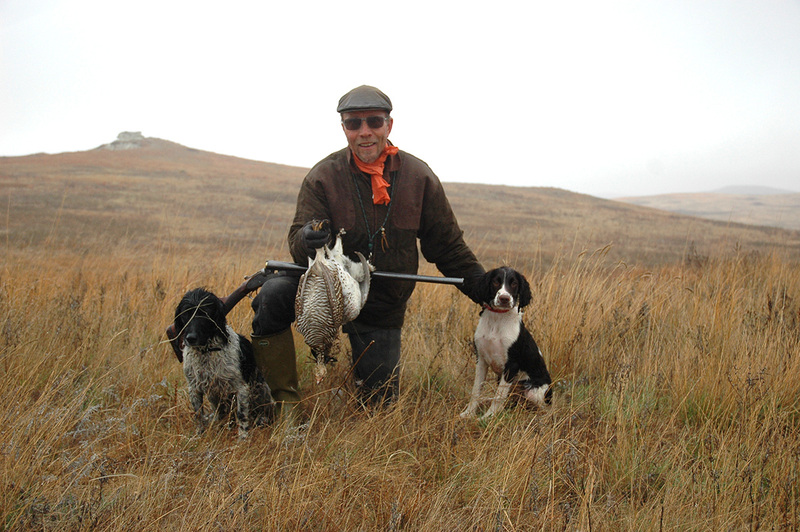 With Mac too old to work a full schedule of hunters I was hosting in South Dakota, Prairie Chicken hunting, I stood without a working dog. Fiona came to the rescue! Fiona was eight when Mhari just gave her to us. What a gift Fiona has been to our family. 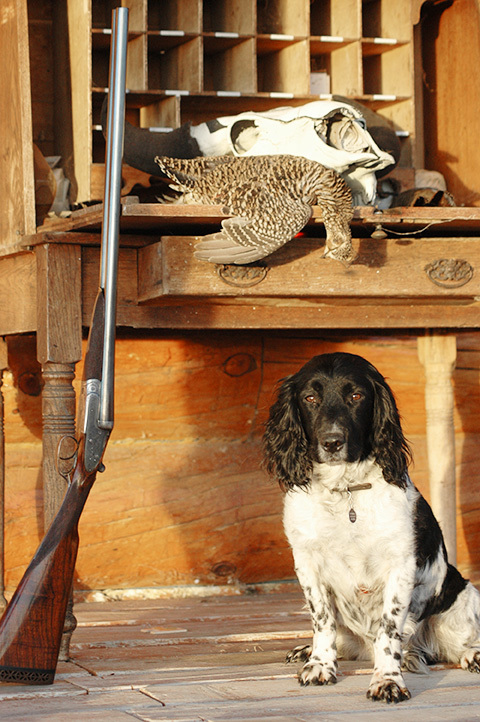 She has not only found her place in our home, she is a skilled hunter who has enjoyed hunting hard for me for multiple wild game bird species over the past few falls here in the Uplands West where I host grouse hunts for four species. Fiona is an amazing tracking and trailing retriever, saving the day on many, way lost, birds that she magically brings to my hand for my hunting friends to be amazed! Three come to mind, a Wild Rooster she found a good mile from its wing tipped flush, a big Boomer… male Prairie Chicken she recovered inside a deep hole and a Columbia Sharptail Grouse, high up in the Colorado Rocky Mountains, that she quietly delivered just as our group agreed to give up on our 30-minute search. The first I realized that Fiona’s back was hurting her, I was hunting at Mountain Grouse Haven with my friend, Dr. Tim Goulart DC. We were hunting two species of Mtn. 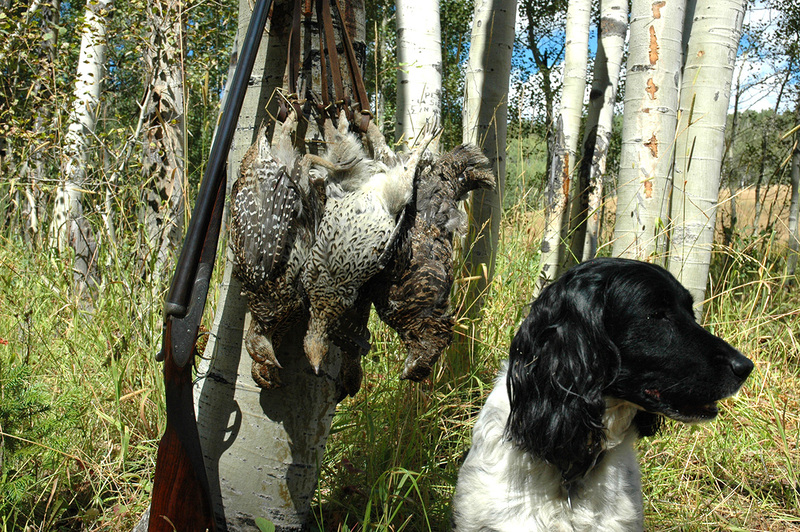 grouse with our spaniels… Blues and Columbia sharptail grouse in one of the most spectacular upland settings I’ve ever been in. It is possible here to bag both grouse species in the same hike, similar to South Dakota Prairie Chickens and Sharptail Grouse! After watching Fiona run, Dr. Tim diagnosed Fiona’s problem and adjusted her with an chiropractic adjustment instrument called an Activator. The transformation was remarkable. While Blue Grouse hunting on the edge of the forest, I have the most beautiful image locked into my memory of Fiona leaping high, up and over a blow down, all stretched out in a sunbeam, high on mountain grouse scent! Fiona was there for Mac in his last years and has mentored our new pup Sunny. 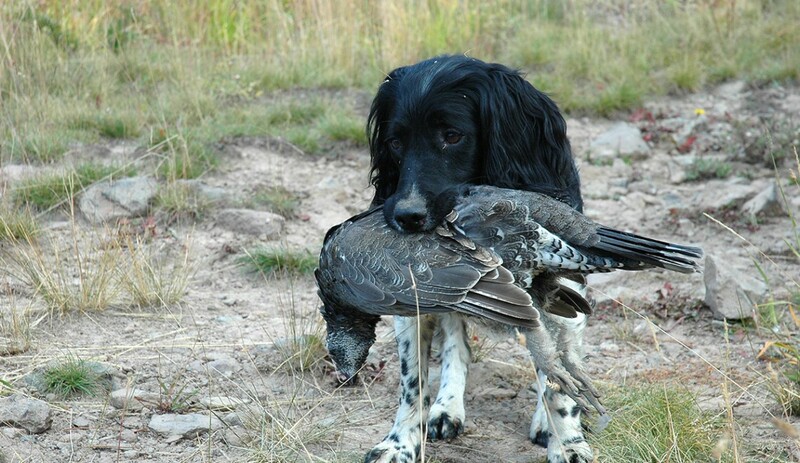 When Sunny was only four months old, Fiona and I started hunting her at Prairie Grouse Haven and progressed through the fall breaking all the puppy training rules, which is an entirely different story all together. Mentoring a puppy takes a lot of patience and care… Fiona has done an outstanding job with this! In the process of responding to Fiona’s lower back pain, I learned how to tap along her spin on all the acupressure points where her pain manifested most and now practice this tapping technique on her regularly to her relief. 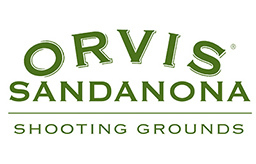 Fiona has had several amazing seasons now at both Mountain Grouse Haven and Prairie Grouse Haven. This is in addition to all the late season quail hunting we do for both Bobs and Scaled Quail, a trip to Wisconsin for Ruffs, plus many Mallards and Doves. Fiona is an outstanding canine citizen just as Mhari said she was and remains the most well behaved spaniel I have owned, a tribute to Mhari’s breeding and training. I have of course been sending Mhari Fiona updates, complete with pics from Fiona’s many hunting adventures. I have included some here for your enjoyment. When Mhari emailed me the first photo of Fiona, I thought she might have some Cocker in her. Mhari laughed and told me that “Fiona only had one littermate and he got all the legs”. 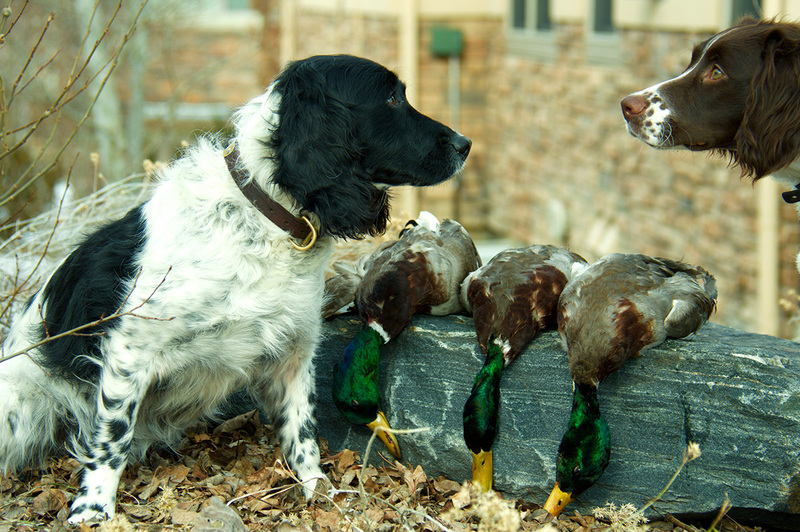 Fiona appears as a genetic through back to the spaniels of merry old England in the days of black powder. Only a pup, Fiona needed a complete blood transfusion, which came from the Vet’s yellow lab. 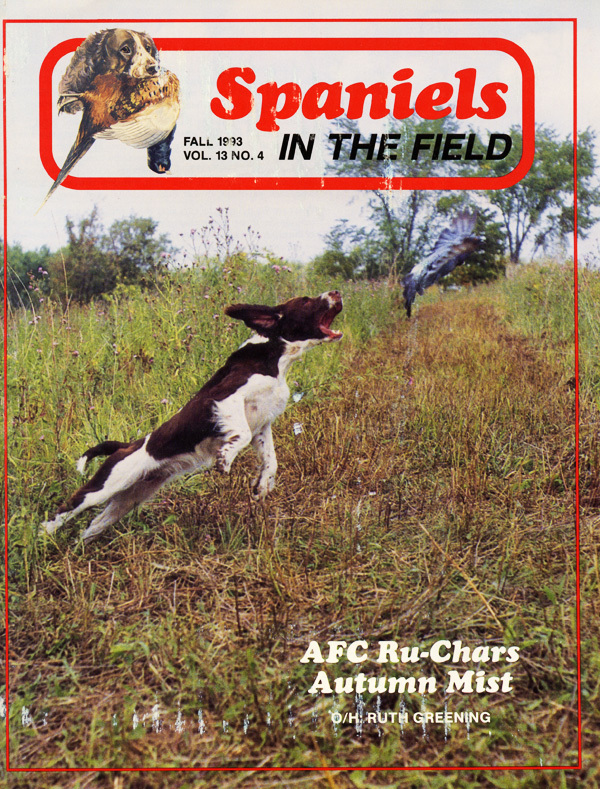 Yet, she still is springing through the field at ten years old, thanks to Lee Chockley. You should see the look in her eyes when I mention Grouse Haven. As Fiona grew older, I wanted to add more medical attention for her and provide extended relief for her back pain. Enter, Lee Chockley, Canine Masseuse extraordinaire. Lee quickly connected with Fiona and she surrendered to his touch as tough a customer as she is. I watched and learned and Fiona loved it. He gently massaged and stretched her leg muscles, putting pressure on the knots and working over them “flattening out the bumps” as he put it. Lee spends a good deal of time with his patients. Fiona kept her eye on me and wagged when I encouraged her with “Good girl”. Immediately afterward, we went for a test run out in the open space behind our home. Lee and I walked and talked together watching Fiona and Sunny work for scent. He encouraged me to keep up the tapping. I shared with Lee that when Fiona is hurting, her right rear leg kicks up and out to the side when she runs and reported that I had been seeing this a lot lately. However, this symptom did not appear for us after her treatment, as Fiona worked fast and strong through the native grass. Lee’s treatment on Fiona lasted several weeks. He paid her other visits with excellent results. Fiona has done extremely well with Lee’s massage, stretching and acupressure technique. I am very grateful to have him as a resource for her. You can bet Fiona will see Lee again prior to the September season opener! My family practices alternative medicine and healthy life practices. So for Fiona I thought, “Why not massage for our working dogs/family pets as well”? 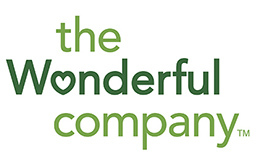 Fiona’s treatments have gone so well, I thought I should share this story with our SITFFR community. It has really made a noticeable difference for Fiona, now ten years old, who is looking at yet another wild and adventurous hunting season ahead! If you are in the Denver metro area, please do give Lee Chockley a call (303-981-1170) and arrange a treatment for your best canine friend. You won’t regret it. Lee is also open to consulting calls. I would also invite you to read my other stories and articles posted here on the SITFFR website in Uplands West.